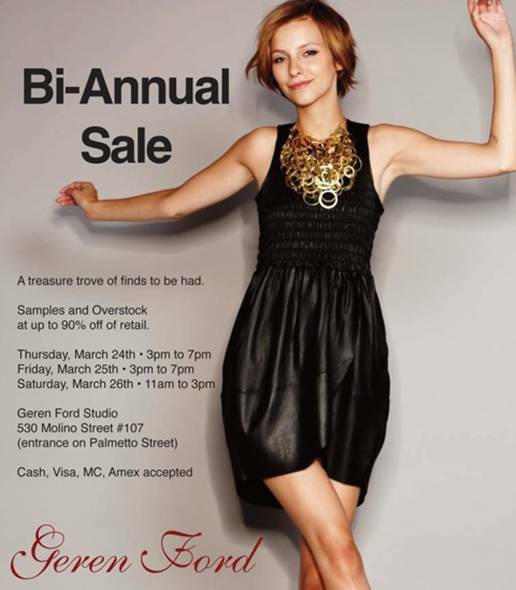 The Geren Ford Bi-Annual Los Angeles Sample Sale is quickly approaching! This one is going to be extra special as they've added previously archived samples dating back to 2007, so lots of good finds to be had. Samples and overstock from Pre-Spring and Spring 2011 are up to 90% off retail. And most of all, nothing will be priced over $100 -including leather! They'll be having giveaways and discounts throughout the day so everyone is bound to walk away with something good. A sale like this one that makes me wish I lived in Los Angeles sometimes!